TOKYO, Japan, June 22, 2017 – Honda announced an overview of its main teams to compete in 2016-2017 FIM*1 Endurance World Championship (EWC) Series Round 5, The 40th “Coca-Cola” Suzuka 8hours Endurance Race (Suzuka 8 hours), to be held at the Suzuka circuit in Mie Prefecture, Japan, on Sunday, July 30. For the 40th running of the Suzuka 8 hours race, a major milestone for the event, Honda will be racing its new CBR1000RR SP2 aiming to regain the title. F.C.C. TSR Honda, participating in every EWC round this season, will aim to win this year’s final round, the Suzuka 8 hours, with Stefan Bradl, currently racing in the FIM Superbike World Championship, and Dominique Aegerter, current FIM MotoGP World Championship (MotoGP) Moto2 rider. MuSASHi RT HARC-PRO. Honda will be aiming to claim its first victory in three years, with Japanese rider Takumi Takahashi, a three-time Suzuka 8 hours winner and currently competing in the JSB1000 class in the MFJ*2 All-Japan Road Race Championship Series (JRR), and MotoGP Moto2 class rider Takaaki Nakagami. They will be joined by last year’s MotoGP Dutch TT winner Jack Miller, who will be competing at the Suzuka 8 hours for the first time. In its 6th consecutive year at the event, Satu HATI. Honda Team Asia, Honda’s best performing team last year by finishing 8th, will challenge the top teams with FIM CEV Repsol European Championship Moto2 rider Dimas Ekky Pratama, and Asia Road Racing Championship riders Ratthapong Wilairot and Md Zaqhwan Zaidi. Au & Teluru Kohara･RT will be represented by JRR JSB1000 class rider Kosuke Akiyoshi, FIM Supersport World Championship rider Hikari Okubo, and MotoGP Moto2 class rider Tetsuta Nagashima. Honda Dream Racing will be recruiting riders to join JRR JSB1000 class rider, Tatsuya Yamaguchi. 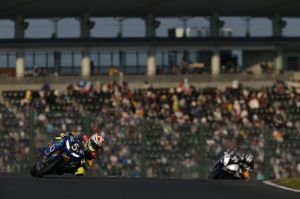 MORIWAKI MOTUL RACING will be back to the Suzuka 8 hours race after a 9-year hiatus, aiming to win the event with Yuki Takahashi and Ryuichi Kiyonari, both currently racing in the JRR JSB1000 class. Honda DREAM RT Sakurai Honda comes back to Suzuka after a one-year break, with JRR J-GP2 class rider Ryo Mizuno and British Superbike Championship rider Jason O’Halloran. Team SuP Dream Honda, the union of 16 Honda component suppliers, will be represented by a true veteran, four-time Suzuka 8 hours winner Shinichi Ito, joined by EWC riders Gregg Black and Josh Hook, to challenge the leaders. * Honda teams as of June 22. Riders are subject to change. * Teams listed in order of bike number.